I’ve had my share of storms since I got my first boat 53 years ago. I’ve looked up into the maw of a tornado while at anchor. I’ve ridden out hurricanes and tropical storms at anchor, at dock, and on a mooring. I clung for days to the bottom behind some rocks in the Bahamas during the “Storm of the Century.” I’ve seen water rise vertically in sheets from the surface just before solid waves flooded down dorade vents on a cabin deck of a well-found boat. (The vents were far inboard and about 7 feet above the waterline.) I’ve watched my dinghy fly straight out from my stern on its painter, above the water, twisting slowly in the wind. No, I’m not bragging, and I’m hardly brave. (“Stupid” may be the word.) I’ve learned from these events and many more that I’m scared to death of storms. But I’ve also learned that there are things you can do to help. Storms are going to come no matter what you’re doing, so you might as well do what you love. There is no one formula that will always work when you know you’re about to get clobbered. One man’s successful tactic can be another’s undoing. Storms may share certain things in common, but they are creatures on their own. And the characteristics of your boat, the geography around you, bottom contours, and many other variables individually tailor the disastrous things a storm can do. There’s one given: We should never lose a healthy fear of storms, and we should never stop trying to learn. The first thing to know is to avoid storms, but no matter how hard you try, you’re going to be caught. Or you may have to prepare for a big one that nobody can avoid. When they come, each skipper has to evaluate the situation at hand and decide what’s best under the circumstances. Here are some of the things that I’ve found useful. They may or may not be relevant when your storm comes, but I hope some will help as you make your own decisions and choose your tactics. It’s been my observation that inadequate or poorly rigged chafing gear is one of the greatest causes of damage to boats on moorings, at anchor, or at dock. Use as much as you can stuff around your lines without making the line jump the cleat or chock. Use it any place a line may chafe. Secure the gear so that it won’t slip out of position. This may involve tying the chafing gear with 1/4-inch nylon cord to points on the boat above and below the chafing gear. Or it may involve tying it to the line itself, above and below the chafing gear. In either case, punch a hole through the multiple layers of gear to fasten the small cord. Use appropriate material for chafing gear. For example, many have long thought that fire hose is good. But reports from recent hurricanes indicate that, as the boat surges and the line slips back and forth inside the hose, the hose and the line heat up because cooling rain isn’t getting through the waterproof hose. Eventually, the line parts. We’ve had success with scraps of tightly woven (but not rubber-backed) high-grade commercial carpeting. There are numerous materials that work. Others have reported success with, for example, multiple layers of tough blue jeans. The denim cloth should let moisture through, it should not turn brittle with heat, and it should not be abrasive to the line it’s supposed to be protecting. For a prolonged storm, you should assume that the chafing gear will eventually wear through. If you’re going to be aboard and the storm will be weak enough to allow you to work on deck, consider rigging one or more sections of chafing material above the point where the line goes through the chock or over a roller. You can then carefully let out the line to position the new chafing material in place as needed. But if the weather is really bad, you can lose hands and fingers and maybe your life trying this. Windage is your enemy. It will make your boat much more likely to move when it shouldn’t. Clear the decks, masts, flybridge, bimini, barbecue, and everything else topside. Also, objects blowing through the air are like bullets. If you don’t clear the decks, you’re more likely to lose your boat, and you’re more likely to harm other boats and people. One of the most obvious failures in this area, and one that I cannot understand, is that we always see a few sailboat owners leave up their furling gear and furled sails. It invariably unfurls, destroying itself, often after causing the boat to break free, resulting in its destruction and that of others around. I’ve done this often when I haven’t had much choice. I can say from experience that it’s a bad, perhaps fatal, idea. The next time you’re riding down the highway at 55 miles per hour, stick your hand out the window and feel the force (if you don’t mind getting hurt). Imagine that on your entire body. Add rain that’s cutting like bullets. You can’t do much of anything when the wind gets to be around 40 miles per hour and over. The forces are overwhelming. Many feel that they can do something to help the boat if needed. You probably cannot, and you can replace that boat, but not yourself. Occasionally when I’ve had to stay aboard in major storms (and, again, I don’t recommend this), I’ve had to wear a wet suit, snorkel, and face mask to go out on deck. But even these precautions don’t give you the strength to handle the forces of a major storm. Anchoring, picking up a mooring, tying at a dock, or hauling out can each have distinct benefits, depending upon the circumstances of your situation. Docks can be boat killers. If you’re considering tying up, look for tall, well-found pilings that will be far higher than any surge. Look for high surrounding land, especially in the direction(s) of the strongest anticipated wind. If the docks are protected by a spit or low land, consider what will happen if a storm tide submerges them. We were once trapped by a rogue tropical storm in an anchorage with miles of marsh between us and the sea. As the eye passed over, I looked out on almost unbroken water to the ocean. Consider the surrounding geography. If the dock is at the head of a bay or a sound into which the wind will pile up the water, you may want to go somewhere else. Check the strength of the piers and other structures. Waves at dock level can be so devastating that some marinas will pull the boards from the docks. Some docks are designed and built with this in mind. Floating docks are necessary in many areas because of tides. They must be protected from waves and have strong, high pilings. On any dock, it’s usually much better to tie to pilings rather than to cleats bolted through boards. If your slip isn’t wide enough for you and your neighbors to surge back and forth without hitting, you should seriously consider moving. The slip also must be wide enough so that you can rig lines that are long enough to allow the boat to ride up on the surge and yet not bump the piles or dock when the tide is lower and the lines are looser. Build a spider web of lines from bow and stern and spring lines to hold your boat off. It’s hard to have too many. The lines must be rigged to handle storm surges and/or negative tides. Ask about marina policy as to securing loose objects and requiring other boat owners to secure properly. Some marinas will check all boats and, if the owner hasn’t done the job, will do it and charge the owner. You want this, because just one boat breaking loose can cause devastation in a marina. “Securing” a boat means more than adding lines and chafing gear. It includes removing all sails and canvas and other items on deck. Turn off unnecessary current. The marina will probably turn off dock current. Probably the only current you’ll want on your boat will be for the bilge pumps. This also applies to most other modes of storm storage. and there are no good anchorages. Hauling out usually involves less preparation compared to other choices. If you decide to haul out, consider the following. The yard grounds should be well above the level of the expected storm surge. During Hurricane Isabel of 2003, many boat owners in the Chesapeake Bay area who thought their boats were safe on the hard (or in lifts) found them demolished, because the surge came into the yards, and floating debris toppled helpless boats. Check for a wind break. If, for example, you expect the wind to come from the northeast and there’s nothing but miles of open land in that direction, you might consider another yard. Check the yard’s preparation policy as to securing loose objects and boats. Check the jack stands. Are they well maintained, or are they rusty and bent? Is the slot to hook the chain strong and in its original shape? Securing the jack stands with chain under the boat is essential to keep them from separating. Over time, the crosspiece into which the chain hooks can become deformed and weakened. The chain should also be in good condition. There should be no slippery material between the pads on the stand and the hull. Usually, the wood pad on the stand suffices. Remember that your boat is built to be supported by the water. It wasn’t built to be supported by point loading in just a few places. The high wind may greatly increase the stress at points of support along the hull. Therefore, it’s important to have enough stands and to strategically place them around the hull to best use the boat’s structure, such as stringers or structural bulkheads, to absorb the stress. Is the ground under the stands firm? Will it become muddy or soft with the rain? Is it level? Torrential rain on a sloping field can quickly undermine the footing of the jack stands. Will the yard do the best it can at pointing the boats into the expected direction of the wind? You can never know for sure what that direction will be, but it’s best to try. Will they tie down boats if appropriate? One yard in central Florida saved all its hauled boats in Hurricane Frances by doing this, while nearby yards suffered great losses when the wind simply toppled the boats off the jack stands. Don’t wait until the last minute to get hauled (or to make preparations for any other mode of survival). The yard will be extremely busy taking care of boats and their own property. If you think this is the route for you, take the time well before the season starts to find a good yard, tell them that you want to be on their haulout list (you may have to pay a fee), and check in well before the storm is near. Know the mooring, and know how well it has been maintained. Many mooring owners will recommend that boats not be left on the mooring in a major storm. There’s a common assumption that a mooring is foolproof, but that’s far from the fact. From the anchoring device to the pennant, all must be able to withstand the enormous stresses from a storm. As with anchor gear, one weak link is fatal. And, as with staying at a dock, if a boat or mooring breaks loose upwind, boats downwind can be demolished. Often, the chain or other rode from the anchor to the top is short in order to get as many boats as is practical into a mooring field and because of the perception that, with the anchor weight on the bottom and the over-strength of the rode, there isn’t a need for a lot of scope. Major storm conditions can change all these factors. For example, a sufficient tide surge can lift a mooring block off the bottom if the rode is very short. And some boat owners, in a sincere desire to prepare, will throw out an anchor to assist the mooring. This may work well unless the wind direction changes, as it often does in a major storm. The close positioning of boats in many mooring fields relies on the assumption that they will all swing together. This may not happen if the boat next to you has an anchor out and you don’t, or if yours is placed differently with respect to the wind. If my boat is on a mooring, I always attach three lines to a mooring during a storm, even one without a name. I rig these lines at slightly different lengths so that if the first parts from chafing through, the second line, and then the third line, will take over. I prefer a 60-lb. original CQR and a Fortress FX 125 on my 53-foot motorsailer for storm anchoring. Other experienced cruisers will have other preferences, both as to gear and methodology. I seldom deploy both anchors at the same time (I feel it’s more of a liability than an aid), but I will often do so in major storm conditions. I prefer heavy chain rode with more than ample nylon snubbing line to stretch when the chain pulls tight. I also drop a loop of chain between the roller and the point of attachment of the snubbing line to the chain. (See my article in PMM Oct. ’03 on this technique.) I put out as much scope as is practical, considering the space around me. Up to a point, more is better. I’ve spent considerable time under water during storms, usually free diving. It’s fascinating to me. (I don’t recommend that you do this. It can be very dangerous.) I’ve watched various anchors and types of rodes react to storm-force winds. The performance of gear from that perspective is often different from what you may assume as you stand on deck. For example, CQR anchors that may have set on their side in good bottoms generally do quite well in straightening out and digging in even better as the winds increase. Also, I’ve noticed that chain will serve as an anchor itself, providing great traction, particularly in a mud or soft sand bottom, before it finally begins to lift off the bottom and straighten out completely in the really strong, prolonged gusts. When this occurs, a long nylon snubber with a loop in the chain between the point of attachment of the snubber and the bow roller will cushion the pull. The chain loop will also diminish yawing. Nylon as a primary rode has great elasticity, which is necessary in storm conditions. However, it is light and will allow the boat to sail back and forth, jerking up hard. A boat anchored with a primary nylon rode will behave so erratically compared to boats using chain that the boats must be spaced very far away from each other. There are varying methods of deployment. Many deploy two anchors in a V formation, with the anchors at an approximately 45-degree angle from the bow, on either side of the anticipated wind. The hope is that the boat will hang to both equally, which helps prevent yawing and, of course, provides additional holding. However, if the wind doesn’t come from the expected direction, the boat may hang to only one anchor. The two rodes can also become twisted around each other if the wind clocks. One marina owner who has anchored many boats in some of the hurricanes that have hit North Carolina prefers a steel cable with a Fortress anchor. He reports that the cable digs deeply into the mud and inhibits yawing as well as violent wind jerks on the anchor. Some prefer to deploy two anchors on what is essentially the same rode, one in advance of the other. This requires careful rigging and some time to deploy, but it’s often an effective tactic. Others deploy one anchor and wait to deploy the other when they’re surer of the wind direction and swing. However, if the storm is bad enough, it may be too dangerous to venture out on the bow to do this. If anchoring or mooring, look for a sheltered hole, as far away from the ocean as you can get. High land all around is usually best. But be sensitive to the wind tunnel effect that can be caused by some mountains or hills. Two peaks close together can tunnel wind through with greatly accelerated speeds. The Pacific Northwest is an area in which you might be particularly likely to encounter this. Check out the shoreline. I prefer anchorages where, if I drag, I’ll drag into a forgiving muddy bottom rather than one of rocks or into docks or other hard structures. Look also for an uncrowded hole. Again, other boats can be your worst enemy. Know the bottom. Soft sand, clay, clay/mud, and sandy mud are among the types of bottom that we’ve found to hold well. A bottom littered with rocks or logs, as are some in the Pacific Northwest, is not the most desirable. While you may seem to hold exceptionally well at first, if you hook onto a rock or log, it is not unusual for these to break loose in the height of the storm, freeing your anchor and prohibiting it from resetting because the debris is still hooked. Accurately assessing the bottom is so important that, if necessary, I drag a small anchor through the bottom and pull it up to see what’s on it to be sure of the type of bottom. If nothing is on the anchor, the bottom is probably sand, rock, or shale. If it’s one of the latter two, and if you’ve used a chain, you should have felt the rock or shale as the anchor and chain bumped along. Chain can telegraph signals to you from the bottom, while nylon will absorb them. Generally, very soft mud, hard, tightly packed sand, and rocks are not good. I’m sure you’ve heard people say this, blithely shrugging their shoulders, when a storm is roaring in and their boat is in peril. That attitude contributes to millions of dollars in losses (that we all have to pay in one form or another) and often personal injury or death. 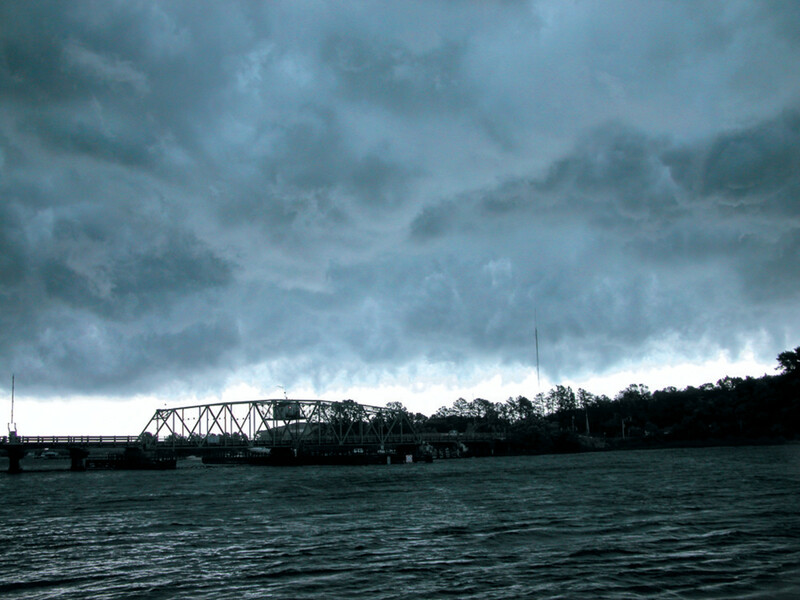 Many insurance policies will help defray the costs of major storm preparations, such as a haulout or moving the boat to safer waters. And, importantly, many insurance policies require that you exercise prudent seamanship and take reasonable steps (that doesn’t mean unsafe steps) to protect your boat. If you don’t, you may find that you’ve lost your coverage. Within the bounds of safety, do all that you can for your boat when you are both facing a big blow.